Sports Promotional Items and Sports Promotional Products. 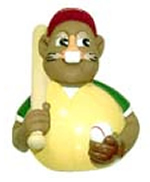 Welcome to our sports figures, team collectibles and mascots. CelebriDucks creates extraordinary sports collectible promotional items for some of the world’s most popular sports figures and teams including the New York Yankees, The Detroit Pistons, Cleveland Indians, Houston Rockets, Cincinnati Reds and more. Baseball, Football, Basketball & Hockey. There is nothing we cannot do. In fact, ESPN ran a poll on their website for the fan’s favorite stadium give-a-way. 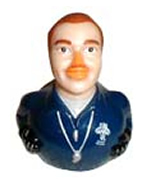 CelebriDucks won the poll beating out Bobbleheads, Beanie Babies, Pez Dispensers, Lunch Boxes, and Match Box Cars! Our custom promotional premium sports advertising items and custom specialty designs are unique in that they all come in their own high quality gift box, float perfectly upright, and never let in any water. So many rubber ducks lean or float on their side. You can toss a Celebriduck off a bridge and it will pop upright as it has been engineered to be one of the best floating rubber ducks available. Another major benefit of CelebriDucks is that we always make our deadlines! To miss a promotional event by so much as one day would be a disaster. We can be counted on to never miss a deadline or ever compromise on quality. With their unsurpassed detail in our sculpting and painting, we are considered the finest rubber ducks on the market and the top custom duck manufacturer in the world. We can also make almost anything for a unique promotional sports item, not just soft and sweet yellow rubber ducks. 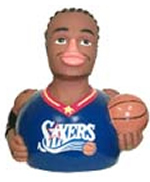 Allen Iverson Promotional Sports Duck for the Philadelphia 76ers sponsored by Reebok. 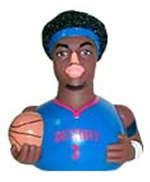 Ben Wallace Promotional Sports Duck for the Detroit Pistons sponsored by Chevrolet. 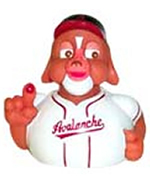 Boomer Promotional Sports Duck for the San Diego Padres farm club. 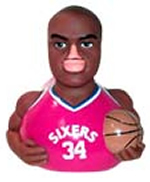 Charles Barkely Promotional Sports Duck for the Philadelphia 76ers sponsored by Subaru. 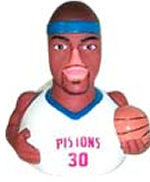 Cliff Robinson Promotional Sports Duck for the Detroit Pistons sponsored by Palace Locker Room. 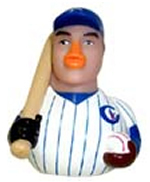 Derek Jeter Promotional Sports Duck for the Columbus Clippers. 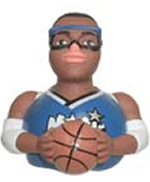 Horace Grant Promotional Sports Duck for the Orlando Magic. 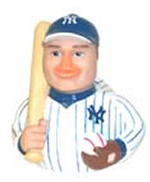 Jason Giambi Promotional Sports Duck for the New York Yankees. 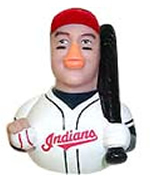 Jim Thorne Promotional Sports Duck for the Cleveland Indians. 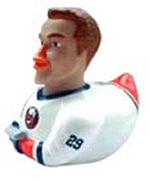 Kenny Jonsson Promotional Sports Duck for the New York Islanders sponsored by GreenPoint Bank. 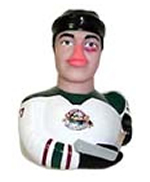 Kerry Topotowski Promotional Sports Duck for the Quad City Mallards. 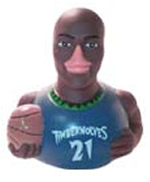 Kevin Garnett Promotional Sports Duck for the Minnesota Timberwolves sponsored by US Bank. 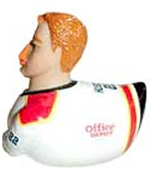 Kristian Promotional Sports Duck for the Florida Panthers sponsored by Office Depot and Sun Sentinel. 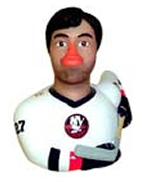 Michael Peca Promotional Sports Duck for the N.Y. Islanders. 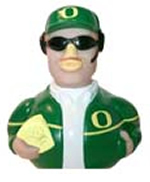 Mike Promotional Sports Duck Oregon Football Coach sponsored by the University of Oregon and Pepsi. Mike Keena Promotional Sports Duck sponsored by Office Depot and Sun Sentinel. 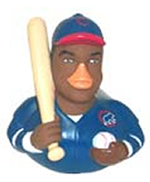 Moises Promotional Sports Duck for the Chicago Cubs sponsored by Gatorade. 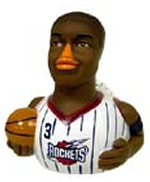 Mooche Nooris Promotional Sports Duck for the Houston Rockets sponsored by SouthWest Airlines. 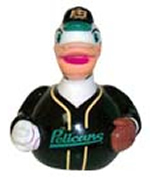 Mugsy Promotional Sports Duck for the Salem Avalanche sponsored by Valleydale. 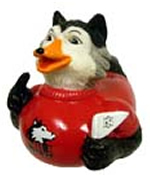 Northern Illinois Huskies Promotional Sports Duck for Northern Illinois University. 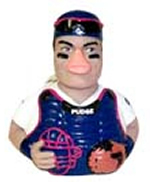 Pudge Rodriguez Promotional Sports Duck for the Texas Rangers sponsored by Clarinex. 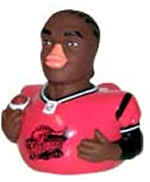 Raymund Philyaw Promotional Sports Duck for the Indianapolis Firebirds sponsored by Dr Pepper. 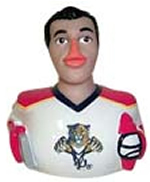 Roberto Luongo Promotional Sports Duck for the Florida Panthers sponsoredby Office Depot and Sun Sentinel. 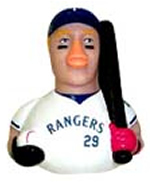 Rusty Greer Promotional Sports Duck for the Texas Rangers sponsored by Dodge. 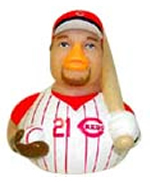 Sean Casey Promotional Sports Duck for the Cincinnati Reds sponsored by Mountain Dew. 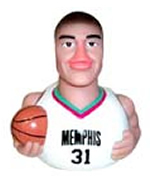 Shane Battier Promotional Sports Duck for the Memphis Grizzlies sponsoredby First Tennessee Bank. 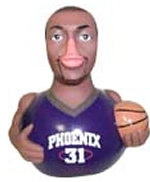 Marion Promotional Sports Duck for the Phoenix Suns sponsored by Sprite. 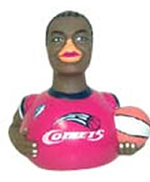 Sheryl Swopes Promotional Sports Duck WNBA Houston Comets. 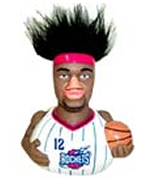 Steve Promotional Sports Duck for the Houston Rockets. 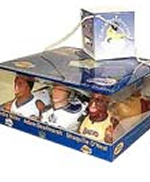 The Six Pack – Kobe, Shaq, Lamar Odom, Andre Miller, Adam Dead marsh & Jason Allison Promotional Sports Ducks set. Sponsored by Team LA, Staples Center & LA Times. 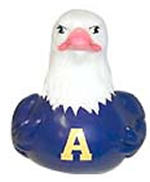 Tuffy Promotional Sports Eagle Mascot Duck for Ashland University sponsored by Ashland University. 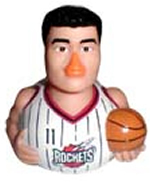 Ming Promotional Sports Duck for the Houston Rockets. 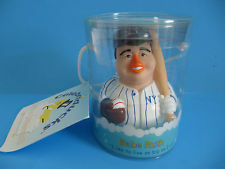 Babe Ruth Promotional Sports Duck for the New York Yankees.